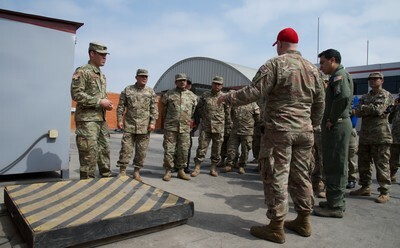 TRAVIS AIR FORCE BASE, Calif. — The 571st Mobility Support Advisory Squadron (MSAS) completed training with the Peruvian Air Force at Las Palmas and Callao Air Bases in Peru, from July 31 through Aug 22, 2018. The mobile training team (MTT) consisted of nine MSAS air advisors and a maintenance officer from MacDill Air Force Base, Florida. The courses were specifically designed to provide squadron leaders the necessary tools to review current operational practices and identify areas for improvement. The tailored leadership training focused on cargo and passenger processes and aircraft maintenance. Throughout the training, the goal was to encourage critical thinking that leads to long-term institutional change. This was a first for the MSAS, as historically the MSAS provides specific skills training. During the cargo and passenger leadership course, the MSAS instructors were able to facilitate a visit to the Air Mobility Command terminal at Callao Air Base in Lima. The visit provided a first-hand opportunity for the students to see AMC’s best practices in action, which provided a tangible link to the leadership practices taught during the course. At Las Palmas Air Base, the maintenance students initially questioned the applicability of the MSAS maintenance teams’ leadership course. However, the students quickly became enthusiastic when they were shown leadership techniques that can empower their noncommissioned officers (NCO) and company grade officers (CGO) to be the drive for positive change. Tuero explained how their lessons focused on maintenance philosophy, continual process improvement, and cross unit inspections, which are some of the building blocks for improving the overall conduct and performance of maintenance units. Similarly, the 571st MSAS air advisors harnessed the students’ motivation through guided discussions, providing tips and tools along the way to enable students with the ability to affect change after the MSAS team departs. The 571st MSAS is a language enabled group of men and women who assess, advise and assist Latin American and Caribbean countries to enhance their airpower capabilities. This team of air advisors assist the Air Force’s enduring building partner capacity mission. Each successive engagement assists to achieve freedom, stability and prosperity in the region, and contributes to the United States Southern Command’s joint intermediate military objectives.